I attended at the Sheldonian Theatre and had the privilege of experiencing a live performance of the acclaimed violin virtuoso, Maxim Vengerov, who was playing in Oxford as Artist in Residence with the Oxford Philomusica . Maxim proceeded to play Frank’s Violin Sonata in A major, Saint-Saëns’ Havanaise and Tchaikovsky’s Valse-Scherzo Op.34. The expressive ease with which Mr. Vengerov coloured the most demanding cadenzas was astonishing. 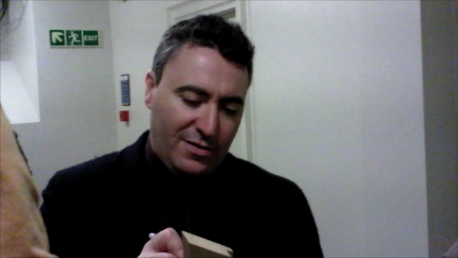 After the concert I joined a queue of groupies and managed to meet with Mr. Vengerov and explain what I was doing. For the montage I received an Oxford Philomusica brochure and Mr Vengerov sent me to visit the Ashmolean museum where he had enjoyed a Vivaldi exhibition.